The dog days of summer. Temperatures in the mid-thirties, the 6th being the hottest day of the year so far, The heavy rain forecast for the weekend of 2nd-4th didn’t materialise but inundated Taiwan instead. The tail-end of wader passage at Mai Po. On 1st there were 18 species of wader on the reserve (16 out on the mud flats) including a Nordmann’s Greenshank, two Far Eastern Curlew, two Red Knot and 21 Whimbrel; there were also four Gull-billed and 11 Little Terns in the bay. Thirty-four Eastern Cattle Egrets were on pond 8a at high tide and there was a Cinnamon Bittern on the scrape. On 6th there were 14 species of wader on the mud flats including a Nordmann’s Greenshank, two Far Eastern Curlew, 106 Terek Sandpipers and 38 Greater Sand Plovers, as well as seven Gull-billed Terns, four White-winged Terns and a Little Tern. Elsewhere, on 2nd and 3rd, a Chestnut-capped Babbler was discovered singing at Kam Tin. This sedentary species occurs in western Guangdong, c.200 kilometres from Hong Kong. 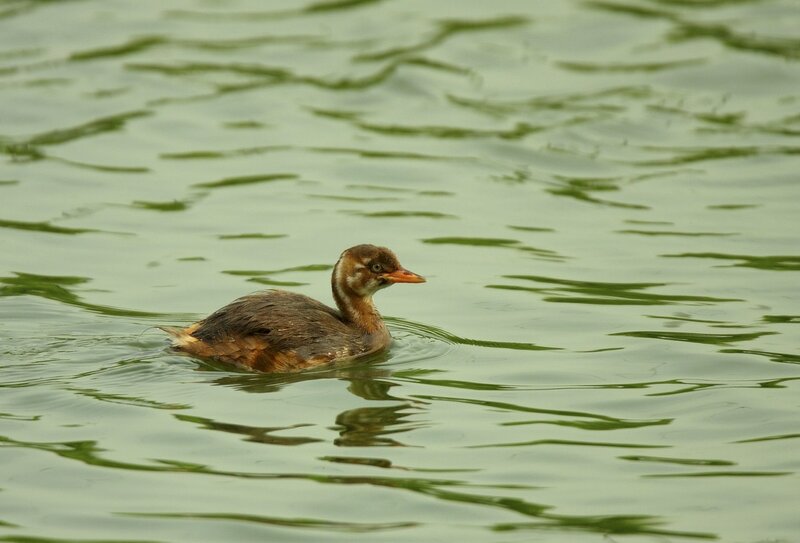 The only previous record of five at Shing Mun on December 12 1993 was considered to be of escaped/released birds. I imagine that this record will also be assigned Category III status. The weather remained fine with temperatures up to 34⁰C until 12th when Tropical Storm Merbok made landfall to the east of Hong Kong around midnight, bringing heavy rain to the territory over the following few days. On 8th, Hok Tau Reservoir held singing Lesser Shortwing, Pygmy Wren Babbler and Hainan Blue Flycatcher. There was also a singing Indochinese Green Magpie. The latter species seems to be establishing a viable feral population in the northeast New Territories and is known to have bred successfully in 2016. A Speckled Piculet was also seen. On 11th, an adult-summer Black-headed Gull and a 3rd-summer Caspian Gull (mongolicus) were seen at Tsim Bei Tsui. On 14th, Mai Po mud flats had 17 wader species as follows: a Black-winged Stilt, 36 Pied Avocets, 18 Grey Plovers, four Lesser Sand Plovers, 18 Greater Sand Plovers, 12 Black-tailed Godwits, three Bar-tailed Godwits, 31 Whimbrels, 18 Eurasian Curlews, two Far Eastern Curlews, 12 Common Greenshanks, two Nordmann’s Greenshanks, 22 Grey-tailed Tattlers, 126 Terek Sandpipers, a Common Sandpiper, a Great Knot and a Red-necked Stint. Also present were 63 White-winged Terns and a Whiskered Tern. The same wader species were still present on 18th (minus the Red-necked Stint but including at least 10 Common Redshanks). Two Far Eastern Curlews and two Nordmann's Greenshanks were again present - on the scrape, not the mud flats, at high tide. Best bird of the period was a Brown Noddy on 18th. It was discovered among a group of breeding Black-naped Terns at Kung Chau Island by a HKBWS team doing a regular tern survey. If accepted, this will be the second Hong Kong record following one seen from Po Toi on May 17th 2006. The Po Toi bird was seen during the passage of Typhoon Chanchu and it seems likely that the Kung Chau bird was brought into Hong Kong waters by Tropical Storm Merbok. Interestingly, seven frigatebirds sp. - an unprecedented number for the territory - were reported near Kau Sai Chau off Sai Kung, also on 18th. The noddy at Kung Chau Island was again present on 19th and has been re-identified as a Black Noddy. This is the first record of this species for Hong Kong. A trough of low pressure around the south China coast continued to bring showers and thunderstorms to the region until 21st. An ensuing ridge of high pressure over southeast China brought hot, sunny weather interspersed with showers to Hong Kong with temperatures up to 33⁰C. The Black Noddy was not at Kung Chau on 20th. However, the birders visiting there in the morning did have seven Lesser Frigatebirds together in the vicinity of the island – clearly the same unidentified frigatebirds that were at Kau Sai Chau on 17th. On 21st a Caspian Tern and five Black-naped Terns were at Sam Mun Tsai. On 24th a 1st-summer Japanese Cormorant was a surprise discovery at the Ninepin Islands. This is the sixth Hong Kong record. Mai Po on 26th still held eleven species of wader, but most were species familiar to bird watchers from Western Europe; most of the Eastern Palearctic species had moved on. Best were 32 Greater Sand Plovers and two Far Eastern Curlews. A Gull-billed Tern was also present.